If you ask me which Google product I love the most, I’d answer without second thought — Google Maps, or simply known as Maps. Many times, I was dumbstruck, with no idea where to go and often I wanted to find where nearby ATM was and to find the better restaurants in the newly-landed area. In all these situations, Google Maps helped me a lot and keeps me helping every time I go to a non-familiar place. We hope this isn’t different in your case either. It is an unquestioned fact that Google Maps is quite useful in our day-to-day life, from finding a coffee shop to getting to the favorite destination of yours without those frequent which-is-the-way-to questions. It’s all good until a certain point — when you lose your internet or connection or get a troubled one. Right from that moment, Google Maps can be as annoying as hell (or, something else, you know ;)). You would get stuck in the traffic filled junction or be dumbstruck in choosing the right away. It was to fix all these issues that Google Maps came with the idea of offline maps! Yes, you heard us right — you can access an offline version of Google Maps if you save it in the right manner. For instance, suppose you’re going to a mountainous area for an adventurous trip. There, you will neither have an active internet connection to seek help from Google Maps nor will you be able to have a stable connection, if ever. Would not that be awesome if you can save the map of that area and access it when wanted — even when you don’t have a single signal? This is what we are talking about. Now, we will tell you how to use Google Maps navigation offline without an internet connection. Note: As we said earlier, offline navigation from Google Maps works by saving the maps beforehand. So, at the point you become offline, the saved map content becomes active. Using this content, you will be able to enable turn-by-turn navigation, destination search and other features offered by Google Maps. You will, however, miss the dynamic data such as traffic. Search for the area — a city, state or country — you want to save. You can see a board on the bottom section which shows information about the searched place. You have to click on the area, upon which it will become full screen. It has to be noted that this feature is available only in the latest version of Google Maps app. In the previous ones, it is possible to save the maps for offline access, but you cannot access features such as directions or searching. Once you have updated, however, you’ve fully-fledged offline navigation without an internet connection. By the way, the offline version of Google Maps becomes active when you don’t have an internet connection, in a fully-fledged form. That option is only for Android users, unfortunately. I’ve tried that on my iPhone 4s and I didn’t got anything on the menu to help me. On Android there is an extra option that can save maps in your SD or internal memory, but at least on the iPhone 4S that option is not available. Google Maps on both iPhone and Android offers support for offline maps, but that might not be enough for those people looking to use the app for navigating without an Internet connection. So nice article, will try it in use. Google maps are indeed very useful, especially to someone like me who is very adventurous but too shy to walk up to people to ask them for directions. I never knew I could use Google map in offline mode, not until I read it here. Thanks a lot, keep writing! I wish this could also be available on my iPhone. Anyways, thanks, it helped in setting up offline navigation in my Dad’s Android phone. Hey Admin, do you have any tricks for iPhone?? If you know about this, then please share with us. Thanks. We have some tips and tricks to improve the battery life of iPhone device. You can check: https://www.techlila.com/tips-improve-apple-iphone-battery-life/. 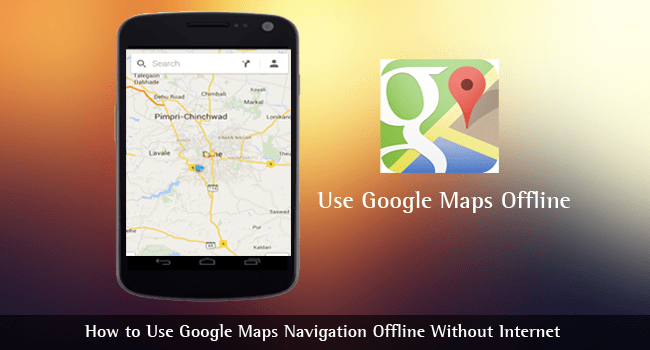 By using Google maps offline it will be easy to find routes even if you have difficulty to manage internet. Google always comes with really innovative ideas. Its a great feature introduced by google maps which has a offline feature, thanks for info. We are happy to know you liked it.